Who would I be, what would I do, if I trusted Myself... 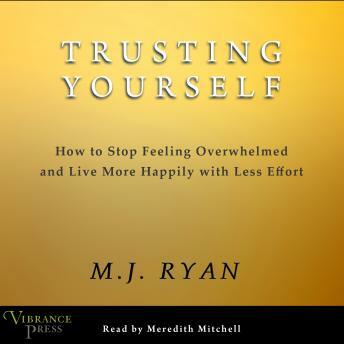 In her warm and inimitable way M.J. Ryan guides us to look at our lives from a different perspective. To imagine what they would be like if we practiced an attitude of self-trust, if we received the gifts trusting ourselves might give us. In an age of constant media messages and so-called expert advice telling us to be richer, thinner, smart, and faster, we're all dogged with worry and self-doubt. Bestselling author M.J. Ryan believes we've become so dependent on 'experts' to tell us how to live our lives that we listen to everyone except ourselves. In Trusting Yourself, Ryan identifies the answers to feeling swept away by life: we already have what it takes to cope. We can learn how to tap into the wisdom inside us by cultivating self-awareness, self-confidence, and self-reliance. Learn how to quiet the critics-inside and out-and trust yourself instead. If you accept that we learn through trial and error, if you believe that we each have unique strengths and that not one of us has to have them all, if you realize that labels only get in the way, then your self-trust will grow, your worries will shrink, and you'll find happiness and success with a lot less effort. This is a life coach in a book that readers can turn to again and again when stress or worry takes over to find more peaceful, saner lives every day.